There are definitely two different girls laying now, though somewhat inconsistently. Some days we get two eggs, some days one, and on others there are none to be found at all. I know Chickenhead is one of the layers, but the second is a mystery. Chickenhead laid one a day for 5 days… then stopped. For five additional days, no eggs in the coop anywhere. 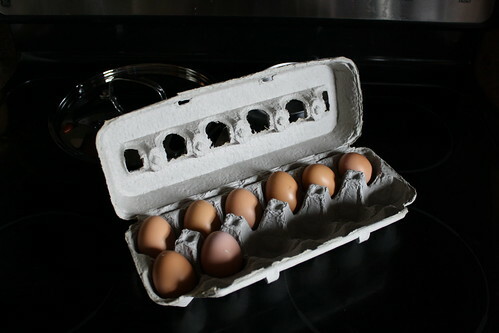 I started to become convinced the girls were eating the eggs, which would be unfortunate, as this is reportedly quite a difficult habit to break. But then, a few days ago, I found not one, but two eggs, and have found at least one per day since. Chickenhead has stopped laying in the roosting chair. One girl is laying in a corner nest of the house, and I find the other eggs laying on the ground outside. Today, I went in around 10 to say hi to the girls and to see if any eggs were present. None were, alas, but Chickenhead was very clingy and was making these little baby peeping sounds. She flew up onto the slanted roof of the still-in-progress nesting box area, cuddled up against me and settled down. After awhile, her tail feathers went down and she looked like she was getting really close to laying. She was panting a little bit, and was silent. Not wanting her to get into the habit of laying her eggs on a slanted roof, I gently relocated her to the ground and sat down with her. She went inside to the nest area, but a moment later came out and flew back up on the roof, pecking at my hair to get my attention. I stood back up and soothed and petted her. Perhaps ten minutes later, she hunched up a bit, stood slightly and after a few seconds I heard the sound of an egg hitting the plywood. She visibly relaxed, but didn’t move for a short time. The egg, amazingly, hadn’t rolled anywhere. When she scooted around a bit, it rolled into my waiting hand. She gently beaked at it to roll it back up underneath her a few times before giving up to gravity. At this point, Nox had flown up to investigate. When the egg again rolled out from under Chickenhead and into my hand, she also tried to use her beak to get it underneath herself. They were definitely not pecking, but gently rolling the egg. I’m so proud of my big girls! They should all be laying soon – their wattles are fully-developed and they’ve all starting taking on a, um, “provocative” stance when we pet them.